In the backroom of The King’s Head Inn, Graham Harris takes a sip of his half pint of bitter and contemplates the woman in the chair next to him. 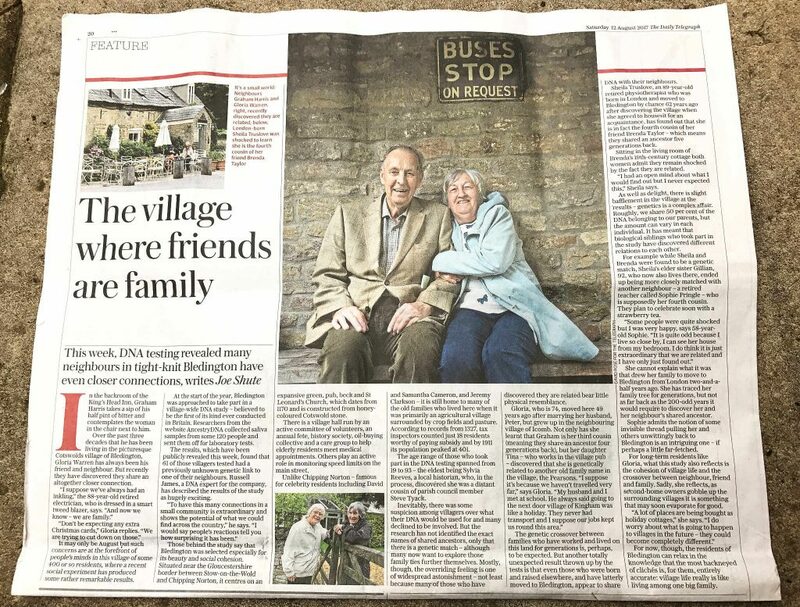 Over the past three decades that he has been living in the picturesque Cotswolds village of Bledington, Gloria Warren has always been his friend and neighbour. But recently they have discovered they share an altogether closer connection. It may be August but such concerns are at the forefront of people’s minds in this village of 400 or so residents, where a recent social experiment has produced some rather remarkable results. At the start of the year Bledington was approached to take part in a village-wide DNA study – believed to be the first of its kind ever conducted in Britain. Researchers from the website AncestryDNA collected saliva samples from some 120 people and sent them off for laboratory tests. The results which have been publicly revealed this week, found that 61 of those villagers tested had a previously unknown genetic link to one of their neighbours. Russell James, a DNA expert for the company has described the results of the study as hugely exciting. Those behind the study say Bledington was selected especially for its beauty and social cohesion. Situated near the Gloucestershire border between Stow-on-the-Wold and Chipping Norton, it centres on an expansive green, pub, beck and St Leonard’s Church, which dates from 1170 and is constructed from honey coloured Cotswold stone. There is a village hall run by an active committee of volunteers, an annual fete, history society, oil-buying collective and a care group to help elderly residents. Others play an active role in monitoring speed limits on the main street. Unlike Chipping Norton famous for celebrity residents including David and Samantha Cameron and Jeremy Clarkson – it is still home to many of the old families whom lived here when it was primarily an agricultural village surrounded by crop fields and pasture. According to records from 1327, tax inspectors counted just 18 residents worthy of paying subsidy and by 1911 its population peaked at 401. The age range of those who took part in the DNA testing spanned from 19 to 93 – the eldest being Sylvia Reeves, a local historian, who, in the process, discovered she was a distant cousin of parish council member Steve Tyack. Inevitably, there was some suspicion among villagers over what their DNA would be used for and many declined to be involved. But the research has not identified the exact names of shared ancestors, only that there is a generic match – although many now want to explore those family ties further themselves. Mostly, though, the overriding feeling is one of widespread astonishment – not least because many of those who have discovered they are related bear little physical resemblance. The genetic crossover between families who have worked and lived on this land for generations is, perhaps, to be expected. But another totally unexpected result thrown up by the tests is that those who were born and raised elsewhere, and have latterly moved to Bledington, appear to share DNA with their neighbours. Sheilia Truslove, an 89-year-old retired physiotherapist who was born in London and moved to Bledington by chance 62 years ago after discovering the village when she agreed to housesit for an acquaintance, has found out that she is in fact forth cousin of her friend Brenda Taylor – which means they share an ancestor five generations back. Sitting in the living room of Brenda’s 19th-century cottage both women admit they remain shocked by the fact they are related. “I had an open mind about what I would find out but I never expected this.” Sheila says. As well as the delight, there is a slight bafflement in the village at the results – genetics is a complex affair. Roughly, we share 50% of the DNA belonging to our parents, but that amount can vary in each individual. It has meant that biological siblings who took part in the study have discovered different relations to each other. For example while Sheila and Brenda were found to be a generic match, Sheila’s older sister Gillian, 92 who now also lives there, ended up being more closely matched with another neighbour – a retired teacher called Sophie Pringle – who is supposedly a fourth cousin. They plan to celebrate soon with a strawberry tea. She cannot explain what it was that drew her family to move to Bledington from London two-and-a-half years ago. She has traced her family tree for generations, but not as far back as 200-odd years it would require to discover her and her neighbours ancestor. Sophie admits the notion of some invisible thread pulling her and others unwittingly back to Bledington is an intriguing one – if perhaps a little far-fetched. For long-term residents like Gloria, what the study also reflects is the cohesion of village life and the cross-over between neighbour, friend and family. Sadly she reflects, as second home owners gobble up surrounding villages it is something that may evaporate for good. For now, though, the residents of Bledington can relax in the knowledge that the most hackneyed of cliches is, for them, entirely accurate: village life is really like living among one big family.